You wake up anywhere in the world. On a tropical island in Thailand, a small Mediterranean town in Turkey or a snow-clad cottage in the Alps. You open your laptop and check up Affiliate Management Dashboard. It turns out that since the evening with you earned $152 during the sleep. It’s your affiliate network that generated passive income streams for you. The referral links and banners that you distributed throughout the internet keep working for you. People find them on blogs, in social media or simply in search engine ads you smartly purchased. They buy your partners’ products and services, and you are earning a commision for each purchase. For a start, it’s just some extra money, but with time it may grow so much it will become your main source of income. The easiest way to achieve it is through affiliate marketing. You are promoting a product or service through a network of affiliates and earning a commision for every purchase. It’s a win-win situation. Stable income for you and very cost effective and scalable method of promotion for the company you cooperate with. Affiliate marketing is one of the best passive income ideas and a great way to earn money online. In this post, I’ll show you how it works. Affiliate Marketing is a Performance Marketing, where the businesses pay just for the desired action. Unlike in traditional display based marketing – such as TV commercials or printed press ads – where advertisers paid huge amounts just for emissions of their message – in affiliate marketing the companies pay just for the effect. In traditional marketing, it didn’t matter how many people actually saw the message – or if they did anything about it. This is why you can count for very high revenue shares. Some of the best Unilink.io customers offer their affiliates up to 40% lifetime revenue on each purchase a referred customer ever makes! Let me explain it to you on an example. Let’s say a company sells monthly plans for their audiobook library for 10 dollars. They want to spread their business, while the cost of serving an additional customer (audiobook listener) is close to zero, since they only have to pay for the download transfer used by them, and they are already operating on a large scale. Using the affiliate marketing that can offer very high commision. Even 50% could be acceptable if they wanted to grow fast. Yes, this means that doing nothing (just promoting a service) you could earn $5 dollars per person each month since most of the recurring payments affiliate programs offer lifetime revenue share. Amazon, the world’s leading e-commerce company, was one of the pioneers of this kind of promotion. Here’s an example of one month (December) earnings of a successful Scotsman. You can read his success story and try to imitate it. It’s a really inspiring account, however, there are affiliate programs that scale even better over time and are worth investing money in. They are offered by companies that base their revenue on recurring payments. You can get the highest dividend promoting financial services product. SimpleFX offers one of the most profitable affiliate programs on Unilink.io platform. The broker offers a global trading tool available in most countries, in many different languages. The customers use the software for free. They can trade forex, stock, gold, or cryptocurrencies. SimpleFX earns their money on the spread, very small percentages added to the price of each trading instrument. The cut is very small, but with time SimpleFX customers make thousands of trades worth even hundreds of thousands of dollars. Participating in SimpleFX affiliate marketing program you can earn up to 40% of the spread. It’s not a joke. Here’s how it works. It all starts with 5% revenue share. Let’s say John Forex is a customer that made his first visit to SimpleFX site after clicking a link you posted on Twitter. First, he created a demo account, where he learned how to use the trading platform. Luckily he’s an experienced forex trader, that makes his living day trading. He found the SimpleFX app very handy, and soon he started doing most of his trade here. When John generated $400 trading spread on Monday, on Tuesday you can cash in $20 commision. That’s not the end. Let’s say John is also a well-known figure in the trading community, and also joined the SimpleFX affiliate program. You get 0.25% spread of each of his recommendation’s, too. On the first glance, it’s not much, but you have to know that the number of affiliates that work on your income grows exponentially. After six months he has attracted 100 new active traders. They are not as experienced as he is, so on average they generate $50 spread a day each. If on Wednesday together they generate $5000 spread in total, you get $12.5 commision. It makes $62.5 daily for one affiliate. One active trader, you brought in. How does it sound for a lifetime passive income? When thinking about passive income affiliate marketing looks like the best solution for anybody that has no capital to buy large amounts of dividend stocks or make real estate investments and purchase rental property. In many ways, affiliate marketing is a holy grail of the young generation. If you belong to the vast majority of people with no real estate investment trust, would like to enjoy life and travel around now, not when your savings account allows you retire, you need to find a reliable source of passive income. 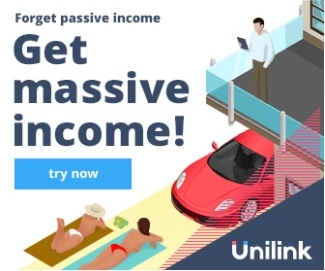 Our mission at Unilink.io is to help companies grow and make it possible for young creative and hard working people to enjoy life while earning a commission from the best affiliate marketing programs.